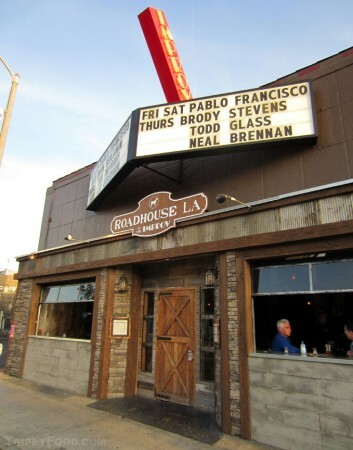 Roadhouse LA's frontage features roll-up windows, corrugated tin and stone trim and an unfinished barn door entrance - a comforting sight for a bubba looking for some backwoods chow and a contrast to its host structure, L.A.'s famous Improv comedy club. For someone looking for a transplanted Texas BBQ joint, the illusion continues inside with walls of reclaimed wood and a massive hay claw dangling from the ceiling in the middle of the dining area, but anyone expecting traditional Southern barbecue quickly gets the concept of improvisation with one look at the menu. 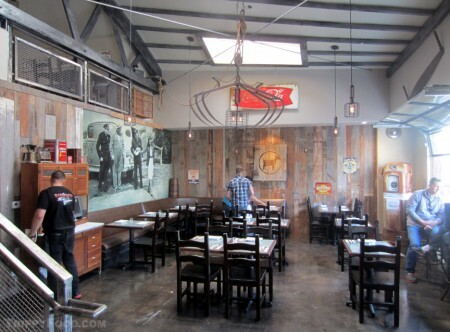 Restaurateur and impresario Adam Fleischman initially brought in Chef Robbie Richter (formerly the cleaver and tongs behind New York City's Fatty 'Cue) to create a concept called "global BBQ". Richter relied on much of what he was known for at Fatty 'Cue, but departed shortly after opening - that's when Fleischman brought in hired gun Kyle Schutte to reimagine not what BBQ is, but in his words, "what BBQ can be". Chef Schutte is no stranger to clever re-working of traditional dishes, and the Roadhouse LA redux melded his Southern origins and influence with cutting-edge cuisine. Even the bar menu is inventive and fun; the "A Little Dickel Dew Ya" sounds like a drink christened by a redneck blue comic - the name is a reference to the blend of house-made "Mountain Dew" syrup, applejack, and whiskey and tastes like a soft drink for grown-ups. 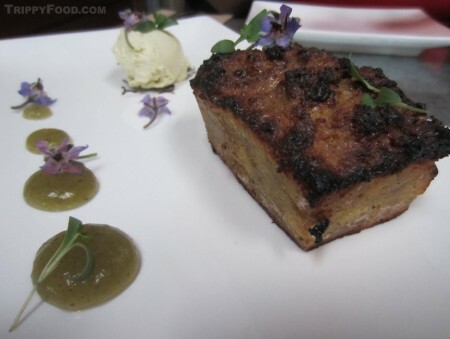 Schutte plays with his food, introducing dishes intentionally out of order; the sturdy and sweet cornbread pudding (listed as "#cornbreadpudding") should be a dessert, but here it is presented as an opener and gussied-up with borage flowers, roasted jalapeno butter, and dabs of tequila/cilantro jelly with a citrus-charred crust. This is not a cornbread for sopping up your baked beans. Chef Schutte introduces breakfast at night with what one could simply disregard as "bacon and eggs" - the thick slab of moist, root beer spice-cured bacon (brined for 2 days) can be easily fork-cut, and the meat is accompanied by scrambled eggs infused with vanilla; a sashimi hamachi dish arrives at the table dusted with a powdery BBQ spice and accompanied by dollops of collard green mousse and sprouted cilantro. Schutte re-invents the ubiquitous LA stable with an outstanding build-it-yourself fish taco made with a thick slab of cold-smoked salmon, frothy guacamole, tequila cream and pomegranate seeds. Much to his chagrin, Schutte's menu features his signature dish by popular demand - chicken-fried watermelon. 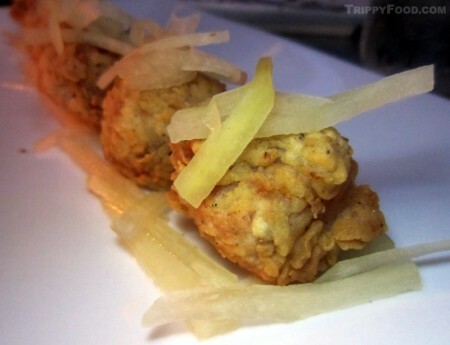 The fruit is apropos with the BBQ theme, but gone are the watermelon sticks from Richter's menu - his crispy, golden balls reveal their moist, sweet payload with a bite that doesn't disintegrate the contrivance. This is fair fare at its finest; Schutte litters the row of orbs with an application of shredded and pickled watermelon rind that would be a superb substitute for sauerkraut on the sausage of his choosing. Despite his Virginian upbringing, Schutte doesn't have a BBQ pedigree, but the casual observer wouldn't accuse him of being green around the gills - the lamb ribs are tender enough that Moms Mabley could polish them off, yet sturdy enough to stand up to the accompanying cucumber arancini. His pork ribs are nothing short of genius - Chef Schutte refers to them as "pork and beans". 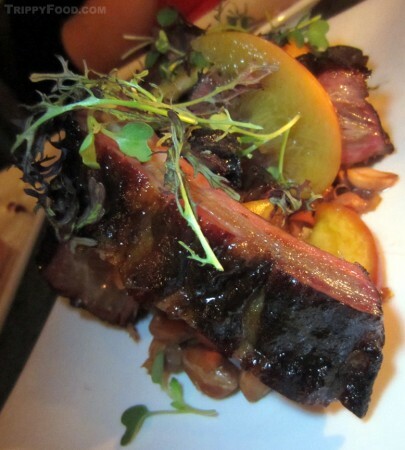 The Niman Ranch pork ribs show off the tang of a ponzu BBQ sauce and are propped up over a bed of lightly pickled peaches and boiled peanuts (with the goobers being the legume of choice to complement the ribs), a loving yet innovative tribute to the great State of Georgia. NOTE: The cost for the food was provided by Roadhouse LA at The Improv. The content provided in this article was not influenced whatsoever by the organizer of the event. 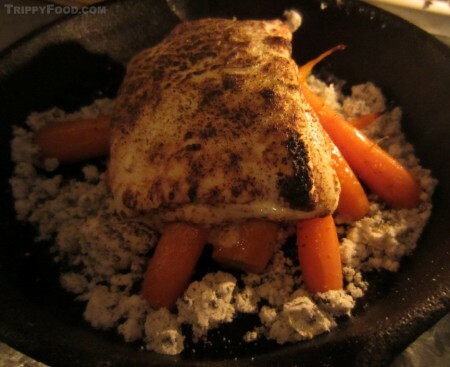 This entry was posted in Southern California and tagged #cornbreadpudding, Adam Fleischman, arancini, Atlanta, bacon, barbecue, BBQ, borage, CA, California, campfire, carrots, chef, chicken-fried, cilantro, collard green, cornbread, Fatty 'Cue, fish taco, GA, Georgia, global, hamachi, Hollywood, jalapeno, Jimmy Dalton, L.A., lamb, Little Dickel Dew Ya, Los Angeles, marshmallow, Mountain Dew, Niman Ranch, peaches, peanuts, pork, pudding, ribs, rind, road house, roadhouse, Roadhouse LA, Robbie Richter, root beer, salmon, smoked, spice, tequila, The Improv, watermelon. Bookmark the permalink. Thanks, Cue – the food is amazing. Glad you enjoyed the article as much as I enjoyed Chef Schutte’s cuisine.